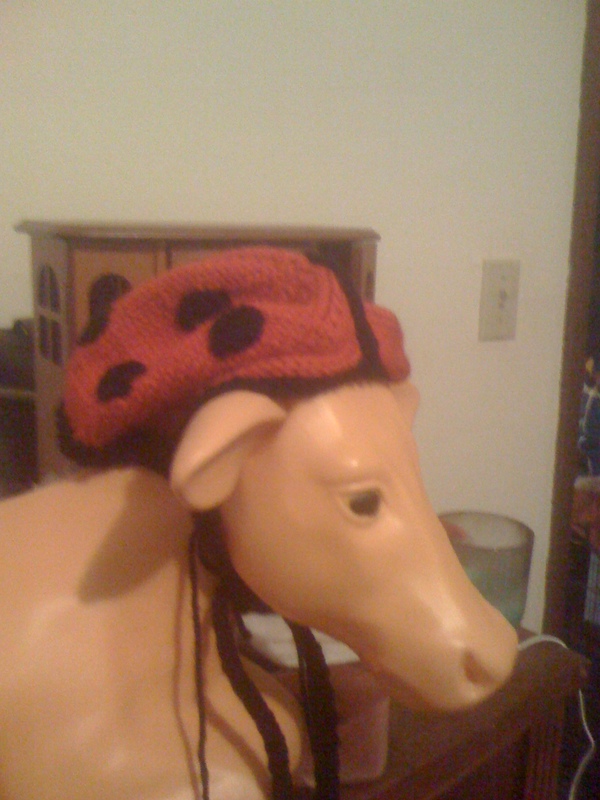 So I got a bee in my bonnet to creat a ladybug hat for little kids. Problem is, I don’t have little kids. Therefore, I have no idea if this is cute or fits or anything. So I stuck it on my glow in the dark cow. Why I have an illuminated cow is a story for a different type of post. In this situation, it looks like a demented bovine bicycle helmet. This to me then presents the image of cows on bicycles which is slightly amusing. Hopefully, I will have an actual child to model it this weekend and I won’t seem so strange. Sizing is difficult if you have no kids but like to make children’s things. I’m just saying. Please forgive the picture quality as it is a picture from my phone with no flash and I have had little sleep today.